WHAT DO THE OFFICES OF INTERIOR DESIGNERS REALLY LOOK LIKE? A BLOG HOP! 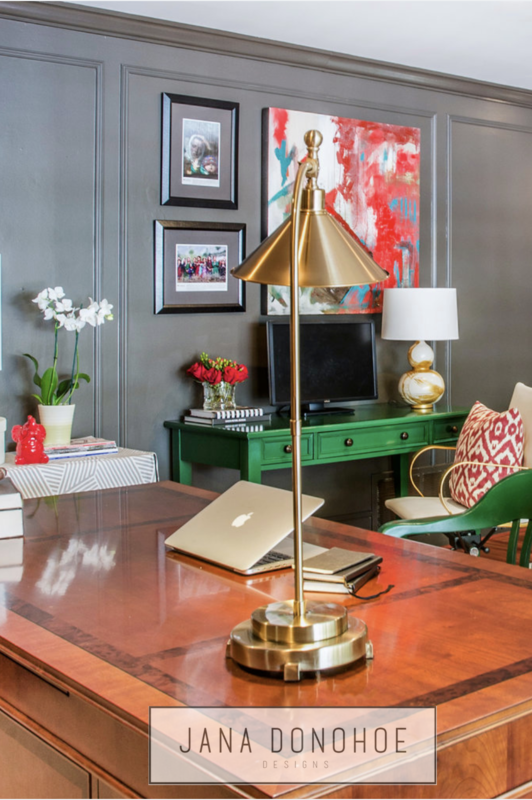 I’m so honored and excited to have been invited by interior designer Carla Aston and Leslie Carothers, the owner of The Kaleidoscope Partnership + Savour Partnership, to participate in their inaugural blog hop showcasing the offices of working interior designers. Carla Aston of Carla Aston -Designed in Houston, Texas. Laura Schwartz - Muller of Four Point Design Build in Los Angeles, California. Laurence Carr of Laurence Carr Design in New York City, New York. Sheri Bruneau of Get It Together in Calgary, Ontario Canada. Leslie Hendrix Wood of Leslie Hendrix Wood Interiors in Midland, Texas. Follow her on Instagram here, here and here. We are all linking up with each other for this and we hope what we’ve done in our own interior design offices will give you inspiration for your own! Again, the links to the post about each of our offices is at the bottom of this post. If you’ve been readers of my blog for awhile, you might remember that I first took on the challenge of re-doing my interior design office for the One Room Challenge a few years ago. The pictures in this post are from that time. At that time, my husband (who is retired military, and now builds apps ( buy his latest: Notecast, for taking notes on podcasts, here - I use it ALL the time and it’s only 4.99! ) and I had decided to share an office together and my challenge was to design a space that worked for both of our tastes and that provided me the storage I needed for all of my samples, etc. It was a BIG challenge and for those of you who know what kind of storage space an interior designer really needs, you will laugh when I tell you that now, 2 years later, my husband has his own office in our basement, as my samples have taken over!! LOL!**! Besides storage, there were some other challenges I had with the design of our joint home office space. 1. I had a limited budget! 2. I had to blend my more modern, feminine tastes with my husband’s more masculine, traditional tastes. 3. Lighting. The room gets a LOT of natural light, but it was too bright during the day, which caused a lot of glare on our computer screens. And even with all of the natural light, it was not always easy to see the details and true colors of my fabric and swatch samples. 4. There were long expanses of flat walls which looked boring. 5. This room is right off of our master bedroom, and we wanted it to also function as our sitting room as well as both of our offices. Solution: Repurposing what we already owned with paint and fabric. I took a desk and chair we already owned and repainted them in a bright, bold green and used a favorite textile as a table covering over an old table we had. You can see all 3 in the image below. Repainting and re-purposing where I can is not only what I believe in doing ( less junk for my 3 young kids to deal with in our landfills as they grow older ) but one of the ways I help my clients save money so they can splurge on the other things they love, that will really make their homes come alive, like fine art, beautiful lighting, etc. CHALLENGE #2: BLENDING MY HUSBAND’S MORE MASCULINE, TRADITIONAL TASTES WITH MY MORE FEMININE, MODERN TASTE. SOLUTION: FINDING A LAWYER’S DESK FOR HIM IN A TRADITIONAL WOOD, BUT WITH CLEAN LINES. My husband desk was one of our first major purchase for this room before I started on the re-design of the office for the #OneRoomChallenge, as you’ll see from the BEFORE picture later in this post. I actually surprised my husband with this desk on our wedding anniversary. I loved the beautiful wood with rectangular burl wood inlay, clean lines and moulding detail. For me, this was the compromise I thought we could both be very happy with and it turned out he loved it. Compromise is essential if you’re sharing a home office with your spouse and you have different tastes and you want to remain happily married! How often do we find that the language our clients are using to describe what they like isn’t actually what they really like? This is where it really helps to get down into the nitty gritty and dissect the ELEMENTS of why something appeals to someone. Is it the color? Is it the massiveness? Is it the carving? Is it the straight lines or the curved lines? Once you can define what ELEMENTS are most appealing, versus getting stuck arguing about a particular piece of furniture, you can almost always find a happy compromise! a. Installed window treatments so we could close them during the day to cut the glare on our computer screens. b. Installed 4 recessed lights, installed an overhead light and I added task lamps, reading lamps and sconces so there would be enough light at night for all of the different ways we use this room and the right kind of light for looking at my fabric samples, swatches, etc. when the window treatments were closed during the day. c. Painted the walls Sherwin William’s BLACK FOX, to absorb some of the natural light and cut down on the glare. You can see just how much natural light floods this room in the image below and all 3 of my solutions for it. With the window treatments closed and all the lights on, it works now, day or night, for all of my needs. CHALLENGE #4 - A long, boring expanse of wall on the wall opposite the window wall. SOLUTION - I added 3 rectangular sets of mouldings to the wall to echo the 3 rectangular shapes in the front of my husband’s desk, which helped to establish the visual rhythm that ties this large room together. NOTE: If you missed my post on MOULDING MISTAKES YOU DON’T WANT TO MAKE (one of your favorites from last year) , you can read it here. CHALLENGE #5 - Because our office is right off of our master bedroom, we wanted it to function as a sitting room, too, where our 3 children could come and talk or just curl up to read a book or play a game while we worked. SOLUTION: Creating a layout that encompassed both of our desks and a seating area for a sofa and two chairs. To this day, my favorite piece in the room is our gray velvet sofa. It’s SO comfortable, but the two red chairs have now found a new home in my living room. After all of these major design challenges were solved, I had a lot of fun layering in the artwork and decorative accessories we both love and styling our built in bookshelves. And because our children are in this room so much with us, it was important to us that they see themselves in it, too, and I had family photos framed and then styled the bookcases with a few of our most special mementos. Can you see the baby shoes on top of the green book? 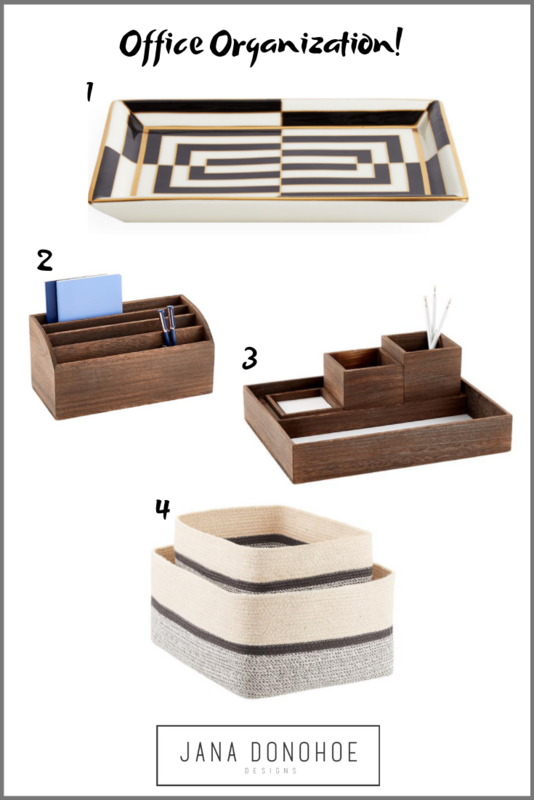 Now, I’d like to share with you some items I love for your own offices, that you can purchase directly from this post. Please note that if you do, I will make a (very) small commission, but it won’t cost you anymore than if you bought it from them online directly. It’s just the merchants way of thanking me for sharing their products with you. I just love these two vases from Jonathan Adler’s line, and there’s hardly anyone who can’t use an adjustable arm reading lamp with an adjustable head that can also slide under a sofa or chair, right? It’s not easy to find reasonably priced, clean lined desk accessories in wood and these really appealed to me, along with the black and white tray that echoes the black and white area rug I layered into my office and these soft sided baskets in grays, creams and blacks for storage next to a desk or sofa. 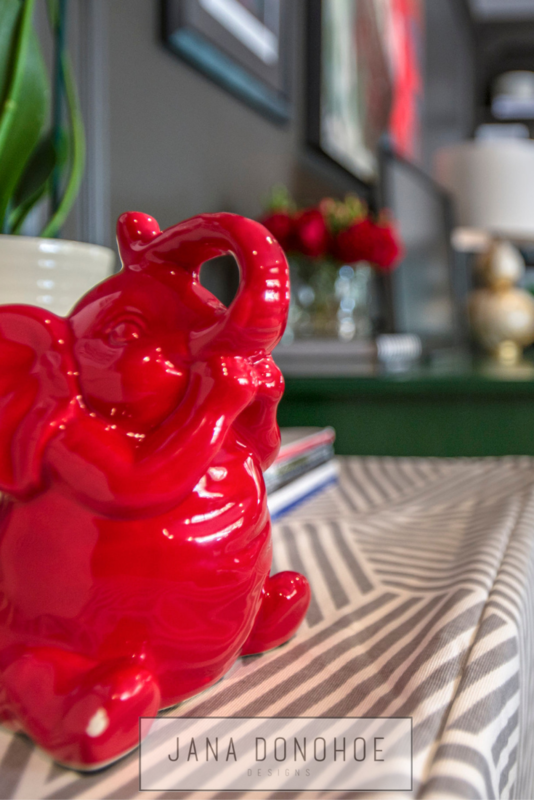 As you can see from looking at my office, I love acrylic or lacquered decorative objects and these from Jonathan Adler weren’t available when I was designing my home office. I might just have to add these in now and I hope you will like them for your homes, too. We also invited Leslie Carothers, who is not an interior designer, but who co-organized this hop, to participate, and here’s her post. 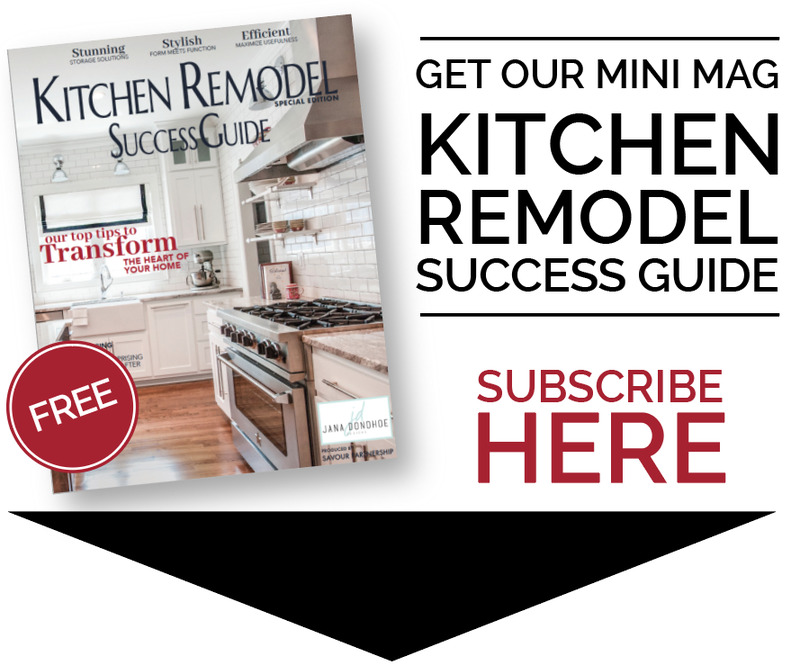 Leslie and her business partner, Sam Henderson, the owners of Savour Partnership, are the ones who designed my mini magazine Kitchen Remodel Success Guide, which you can get for free by subscribing to my blog. Look for it over on the right hand side of my blog. Leslie is also the owner of a popular Facebook Group for interior designers called #DesignWealth (if you’re a fellow interior designer, please click here to Request To Join) and it’s through a suggestion from Carla, who is in the Group with me, that we all came together for this first blog hop. For any of my clients or potential clients reading this, if you’re ready to have your own offices re-designed - whether at home or in a commercial setting, I’d love to help you and you can contact me by clicking here. As always, thank you to my husband who has always been so supportive of me sharing our home with all of you. Not every husband is willing to give up personal privacy to help support his wife’s career, and I want him to know how much I appreciate it! And as I promised at the beginning of this post, a look at the BEFORE in the top left corner of the image below! Who can relate to why this room NEEDED the #OneRoomChallenge deadline for me to focus on it and just get it done - LOL??!!!! Speaking of the #OneRoomChallenge, I’ll be starting the #Spring2019ORC next week, and this time I’ll be re-doing my other daughter’s bedroom. Please subscribe to my blog now if you haven’t done it already to follow along and watch for my weekly progress posts in your inbox. If you missed how my other daughter’s bedroom turned out for the Fall 2017 #OneRoomChallenge, click here. I think a lot of you who are Mom readers will be able to relate to the BEFORE pictures in that post - LOL! !